For Phumelele Bhengu, it is not about proving his doubters wrong after he was rejected by a number of clubs before Tshakhuma Tsha Madzivhandila gave him a chance in January. And to say he has repaid the Limpopo based side’s faith would be an understatement as the former Moroka Swallows player has scored nine goals and promises more. 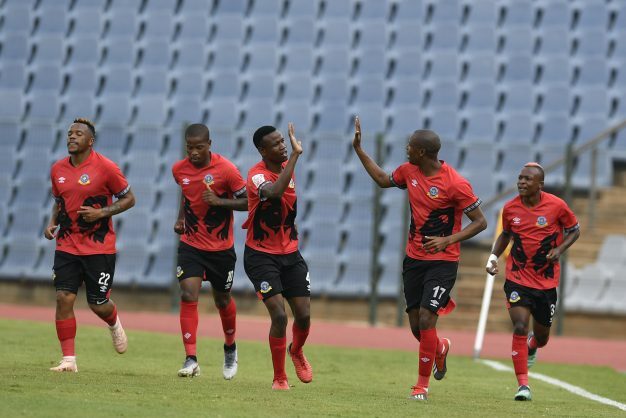 Bhengu scored a brace as Tshakhuma whipped Maccabi 3-0 at Dobsonville Stadium Stadium on Sunday afternoon to move to fifth position on the National First Division (NFD) standings, five points behind leaders Stellenbosch United. Lucky Khumalo scored the other goal from a free kick. Mathematically, Tshakhuma can still win automatic promotion but Bhengu chose to be more realistic with their chances. “We have built up momentum. We have won four games in a row and now we need to keep consistency – the more the team wins the more it becomes a habit. Our chances of making the playoffs are now really good. We will take it one game at a time and we don’t want to get overly excited. But we can still get automatic promotion but realistically it is playoffs that we are targeting now,” he said. Tshakhuma had a brilliant start but stuttered at some point which led to then coach Sello Chokoe being fired and replaced by Moma Medic. “They had very young players in the first half of the season and when they brought us with our experience in January things changed. It took some time for us to gel. The changing of coaches also was a little distraction. But the new coach came and we have found our combinations again,” commented Bhengu on the situation. The 29-year-old former SuperSport United player said he is not scoring goals to prove a point to anyone although he admitted that it hurt when people spread lies about him, saying he was finished and was an alcoholic despite him being a teetotaller. Abantfu Bemthetho moved their game back to KaBokweni Stadium hoping the smaller pitch would not suit AmaTuks but were surprised when the Pretoria managed to eke out a result. Moses Mokasi and Samuel Julies were the scorers for Zipho Dlangalala’s team while William Nkosi’s goal was not enough to earn his side anything from the game. The goalless draw did little for either side. But it will be Ezenkosi who will be happier with the point away. They were however made to sweat for it. With three games to go, both remain in the wrong end of the log. Ubuntu turned on the style and showed their intentions of avoiding relegation when they thrashed Richards bay 5-0 with Waseem Isaacs, Devon Saal, Ludovic Ndzie, Siyambonga Madikane and Clint Fredericks doing the damage. It was the Natal Rich Boys’ second defeat in a row and has seriously dented their chances of making the playoffs. Stellies’ automatic promotion chances were dealt a heavy blow with this 2-1 defeat. They are now just one point ahead of Ajax Cape Town who have hit form at the right time. Pule Mmodi gave the visitors the lead but it was not long before Rafiq De Goede equalised. But Menzi Ndwandwe was on hand to complete the upset at Idas valley Stadium. Mathematically, Siyavutha can still avoid relegation but it looks unlikely as the division’s longest surviving team suffered another defeat at home to Mpumalanga neighbours Mbombela. Sekela Sithole was the man who ensured Tingwenyama stay abreast of the hunting pack in the race for promotion. The Urban Warriors look to be cruising back to the Absa Premiership as they have picked up form at the right time and are now just one point behind Stellies with three games to go. Tashreeq Morris was the man as Ajax had to fight really hard to eke put the three points. His goal was enough to seal the win. Eagles got back to winning ways again and kept their promotion chances alive with a win over the Rockets. Samuel Manganyi was the hero of the day with his goal ensuring the KwaZulu-Natal side escape the Kameelsrivier Stadium with the full points which leaves them two points behind the leaders.